The second development focuses on a compound containing semi-aromatic Polyamide (PA9T) as the main polymer. Polytron® is one of the three main product families at Polyram. This family is characterized by polymers fully impregnated with ultra-long glass fibers with unidirectional features. The reinforcement level varies and can reach up to 60%. Production is carried out in specialized facilities and requires proprietary knowledge and technique. The glass fibers are fed continuously to a designated die and are embedded in the resin matrix. The output pellet length of these materials corresponds to the length of the glass fibers embedded in it, and can be 12 mm or more. The short glass fibers embedded reach a length of 0.3 mm. In order to maintain optimal fiber length retention in the final injected product, several changes must be made to reduce the shear forces applied to the fiber, both in the injection process and in the mold design. A correct mold design enables final injected fiber length to reach 2-6mm. As shown in the accompanying graph, this length allows for especially high impact values, a tendency that can already be ascertained when the fiber length exceeds 1 mm (Figure 1). Using long fibers allows for the additional benefit of high dimensional stability of the material. The long fibers act as a three-dimensional supporting grid that reinforces the part, enabling high dimensional accuracy and creep resistance. 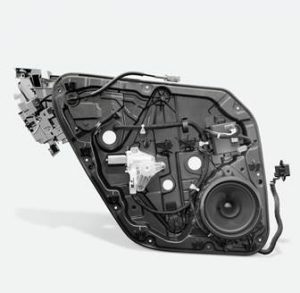 This advantage comes to full use in the automotive industry, in large parts, such as door carrier (Figure 2) and instrument panel, which serve as the base for other connections. PP-based long-fiber compounds are not new at Polyram. In fact, it was Polyram who first managed to replace the traditional airbag canister (made of PA reinforced with short fibers) with a canister made of PP reinforced with long fibers. The new, low-emission (LE) materials are also based on PP and meet the strictest automotive industry standards that dictate a minimal emission level. They have successfully passed appropriate tests in external, independent laboratories. Polyram LE products have also passed the acceptance tests of leading car manufacturers such as Mercedes and VW with flying colors. Polyram’s Polytron® resins are successfully used in the automotive industry, gaining first-class international reputation. An independent report designed for automotive manufacturers recommends Polyram as a leading supplier. Each standard Polytron® product can now be provided also in its new form as a low-emission grade. P30B03LE, a 30% glass copolymer used in the production of airbag canisters. “The global trend is that all the internal vehicle parts meet the low emission requirements and therefore there is an expected increase of use for these materials,” explains Jacob Liublin, director of Polyram’s engineering department. The new Polytron® developments launched support the global trend to reduce the use of metal parts in the automotive industry. If in the past the weight of a vehicle reached approximately 2 tons, the weight of new vehicles has dropped significantly and currently stands at 1.2 tons, 200 kg of which is plastic (Figure 3). The second development is based on the PA9T semi-aromatic Polyamide compound. 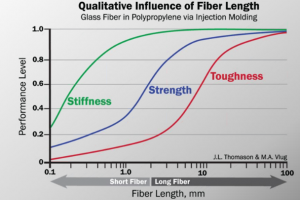 This resin shows an improvement in all mechanical parameters relative to PA 6/6 with the same fiber content – improvement in tensile strength, tensile modulus, flexural modulus, flexural strength and impact resistance (Table 1). Table 1: Mechanical properties comparison: Polyamide 6/6 vs. new compound containing PA9T. An additional advantage, this material maintains its properties even after acclimation in humidity conditions, as opposed to PA 6/6 that affected by environmental humidity conditions. The development is completed and the new compound is launched and currently demonstrated to leading Polyram customers. It is hoped that this improved grade will allow for the replacement of metal parts to which any plastic substitutes have not yet been found. Potential fields of use are the automotive industry, but also the military industry. 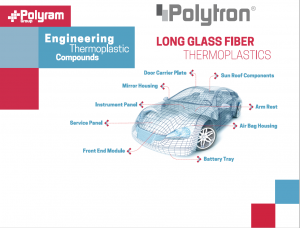 Polyram is considering expanding the Polytron® family to other polymers and fibers, such as long carbon fibers, which have a very high strength to weight ratio, and additional aromatic PA.